Truly Polished: Yes, that's right, more nail mail! Yes, that's right, more nail mail! Seems like I'm posting nail mail every day! I had ordered so many things around the same time and they all started arriving a couple of days ago! 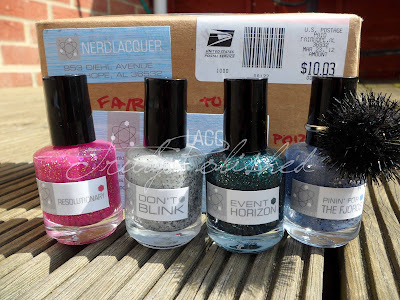 This package from Nerd Lacquer is my last online order, now I'm just waiting for a few swap packages then I'm all done for the moment on nail mail! The polishes I chose were Resolutionary, Don't Blink, Event Horizon and Pinin' for the Fjords. The black bobbly thing on Pinin' for the Fjords is a ring I got in my package! I've swatched two of these already, I couldn't help myself, so they'll be coming up in the next few days! I wish I'd bought more, I wanted 3 others as well, but needed to take it easy on the funds! Their polishes are just amazing, and judging by the two I've swatched already, the formula is amazing! I haven't tried Don't Blink yet. Just Resolutionary and Pinin' for the Fjords. Hope it was just a bad batch and that mine isn't too watery! I saw you blog over at Island Girl Insights so I followed. These polishes are cute, I'm loving the pink. Thanks for following! I actually have the pink polish coming up in tomorrow's post so stay tuned, it's so pretty!